Soybean oil is in almost all fast food and ultra-processed packaged foods. Unfortunately, it is not a healthy option. Since it is so high in easily oxidizable omega-6, it’s a poor cooking oil choice. This article takes a look at eight harmful effects of soybean oil backed by scientific research. Look around, and it’s clear to see that Western society has an obesity problem. For instance, 2 out of every 3 adults in the United States (68.8%) are either overweight or obese (1). 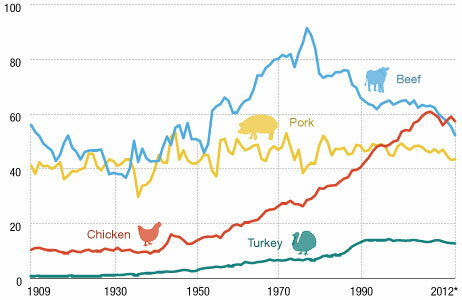 As you can see, the consumption of red meat has actually fallen over the past several decades while leaner poultry increases in popularity. However, if we are looking for a possible dietary villain, then soybean oil consumption has grown by a huge magnitude. It is in almost everything we eat; not only as a cooking oil but also in salad dressings and processed foods. And studies show that it is “more obesogenic and diabetogenic than fructose” (2). Vegetable oils were almost unheard of in the early 20th century. In contrast, they are everywhere these days. Specifically, domestic consumption of soybean oil has more than quadrupled from 1,652,000 tons in 1964 to 6,576,000 tons as of 2016 (3). Key Point: Animal studies show that soybean oil uniquely causes obesity and diabetes compared to other fats. Based on the obesity crisis, perhaps the same is true in humans. As shown above, soybean oil is predominantly a source of polyunsaturated fats (PUFA). The omega 6 to 3 ratio is approximately 7.4: 1. When you consider that soybean oil is in almost everything, it’s not hard to imagine someone having 4 or 5 tablespoons per day. In other words, about 30 grams of omega-6 and only 4 grams of omega-3. A huge difference. Although both omega-3 and omega-6 are essential fatty acids, we should consume them in relative balance. Research shows that ancestral diets were approaching a 1:1 ratio (6). Due to the excessive amount of vegetable oils in the modern diet, people are eating way too much omega-6 and nowhere near enough omega-3. Notably, estimates place the modern diet as having a ratio of 20:1 or higher (6). Omega-6 is an important fatty acid that is pro-inflammatory in nature, and this is a good thing. For instance, some inflammation in the body is necessary for healing cuts and wounds. However, in excessive amounts it causes our body to stay in an inflammatory state — and chronic inflammation is a known risk for the majority of illnesses (7). As omega-6 competes with omega-3 for uptake into our cells, too much omega-6 means a deficiency of anti-inflammatory omega-3 (8). Studies show that a lower dietary omega-6 to omega-3 ratio reduces inflammation and mortality risk from heart disease (9). Chronic diseases such as diabetes, obesity, IBD and arthritis all have associations with increased omega-6. Imbalances in the omega 6 to 3 ratio have likely increased the prevalence of multiple inflammatory, disease-causing processes (10). That said, this is not a problem unique to soybean oil. Other oils rich in polyunsaturated fats such as grapeseed oil have the same problems. Key Point: Soybean oil is in almost everything and significantly contributes to the excessive amounts of omega-6 in our diet. As a result, harmful effects of inflammation are becoming the norm. Despite the food industry’s message that soybean oil is ‘heart healthy,’ most people with interest in nutrition know better. Compared to saturated fats, soybean oil is very unstable as it is predominantly a polyunsaturated fat. 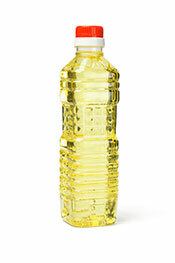 Vegetable oils are susceptible to oxidation when exposed to heat, which can cause their fats to oxidize. Consuming oxidized fats has a detrimental impact on blood pressure and cholesterol and also increases inflammation (11). An unbalanced over-production of omega-6 in the body has a strong association with atherosclerotic diseases (cardiovascular disease) (12). ‘Heart healthy’ vegetable oils possess an “undesirable PUFA content.” Current data suggests that switching to traditional fats like ghee and coconut oil “would reduce the risk of heart disease” (13). And this is just a small drop in a large ocean of negative studies. Have a search for yourself and discover the ‘heart healthy’ myth. Key Point: Soybean oil is the very opposite of heart healthy. In particular, a large number of studies show the harmful effects it can exert on our cells. Do you know how to make olive or avocado oil? It is a natural process that uses a cold-press to squeeze the oil out of the fruit and then bottle it. As you can see, producing soybean oil is far from ‘natural’ and involves an enormous amount of chemical refining. However, this process isn’t unique to only soybean oil, and other processed vegetable oils such as Canola oil also use it. Does Soybean Oil in Stores Contain These Chemicals? Firstly, the manufacturers claim the finished product doesn’t contain any appreciable amount of these chemicals (because the oil is “cleaned” and “refined”). Despite this, studies show that residual amounts usually remain in the finished oil. Based on equivalent-dose animal studies, these amounts are apparently safe (15). However, independent tests have investigated the issue and show that hexane residues “10 times higher than what the FDA considers normal” appear in soy products (16). No FDA regulation requires testing vegetable oils for hexane contamination. Key Point: Soybean oil contains residues of the chemical solvent hexane. Tests show that these amounts may be higher than what is considered safe, potentially leading to harmful effects. The above graph shows the explosion in the consumption of polyunsaturated fat over the past century. As soybean oil is the most significant source of omega-6 in the US, it is a major part of this trend. Polyunsaturated fats are missing many hydrogen atoms; as a result, their carbon atoms are very fragile and susceptible to oxidization. The first thing to remember here is that our cells and tissues predominantly contain saturated and monounsaturated fat. For one thing, this makes the fat in our cells stable. Just like vegetable oils can oxidize due to air, light, or heat exposure, so can fats inside our body. Therefore, if we are consuming large amounts of omega-6 through vegetable oil, this polyunsaturated fat slowly changes the fatty acid composition of our cells. Omega-6 is a “melanoma stimulator” because it makes our skin cells susceptible to damage from UV rays (17). An animal study separated mice into different groups and fed them varying amounts of dietary omega-6 PUFA. The higher their dietary intake, the more they developed cancerous tumors (18). Key Point: Excessive amounts of omega-6 change the fatty acid profile in all our cells. Significantly, this makes our cells more fragile and leads to various health-damaging impacts. Not only does soybean oil have harmful effects but so do the broader range of soy-based foods. Whether soy is healthy or not is a persistent topic of discussion, with various studies showing harm and others showing positive health effects. However, not all soy is the same and fermented soy—like Japanese staples miso and natto—is an entirely different category compared to processed soy products. Soy mimics the effects of estrogen—the female hormone—in the body (19). Infants fed soy have circulating phytoestrogens 13,000-22,000 times higher than natural estrogen levels; at this time, the long-term reproductive effects are unclear. Additionally, adult males consuming soy products may experience fertility issues (20, 21). Existing data for the health benefits of soy is “inadequate and inconsistent,” and there is concern that widely consuming soy products may cause harm to the public (22, 23, 24). Key Point: Soy mimics the effects of estrogen and may cause a range of damaging impacts in the body. In particular, there are strong concerns regarding soy consumption and fertility issues. Due to the unstable composition of soybean oil, exposing it to heat is a terrible idea. In contrast to saturated fats, omega-6 vegetable oils are very prone to oxidation. However, the problem is that restaurants and fast food chains around the world even use soybean oil for deep drying. Using soybean oil at high heat virtually guarantees a large dose of oxidized fats (25). Trans fats, toxic aldehydes, and various other “volatile compounds’ form when frying soybean oil at high heat (26, 27). Heat degrades omega-6 vegetable oils into toxic compounds that have “properties that often signal carcinogenesis” (28). One study fed female rats either soybean oil or ghee; the soybean oil group had higher tumor incidence, larger tumor size, and a more rapid onset of cancer (29). In animal studies, soy oils oxidized through heating cause oxidative stress and also increase the blood pressure in subjects (30). Key Point: Soybean oil is full of polyunsaturated fats which can easily oxidize. Oxidation creates harmful compounds that have dangerous effects in our body. The industrial giant Monsanto’s glyphosate is one of the most controversial topics in the health world. It is a chemical pesticide which the world health organization label as “probably carcinogenic to humans.” Glyphosate has links to a variety of modern, chronic diseases including cancer and neurological diseases (31, 32, 33, 34). Over 90% of soybeans are genetically modified (GMO) for resistance to glyphosate. This modification allows the plant to survive being sprayed with pesticides and herbicides (35). The soybeans not treated with glyphosate all had better nutritional profiles than the GMO beans. Glyphosate-sprayed soybeans contain residual amounts of the chemical. GMO soybeans are responsible for the vast majority of soybean oil. Many people have a concern that these scientifically modified beans may damage health. Key Point: GMO soybeans sprayed with harmful glyphosate are used to produce soybean oil. Overall, the evidence is clear that soybean oil poses numerous dangers to our health. On the positive side, there is no reason whatsoever to use this highly processed oil as there are many better alternatives. If you are looking for a substitute for soybean oil, then it is better to use fat based around saturated and monounsaturated fats. Animal fats such as lard, butter, and ghee are all perfectly healthy. Fruit oils such as avocado, coconut and olive oil are also a good choice. I bought a multivitamins and minerals supplement and on the box says antioxidant. Then I read the ingredients and the first ingredient is soybean oil and thought something is wrong here. 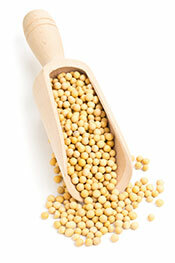 Why those laboratories have to put soybean in multivitamins and minerals supplements? Thanks for the info! Certain types of vitamins are fat-soluble, which means that they need a source of fat for proper absorption. In truth, the amounts in capsules are minimal, and it is better to take them alongside a meal with a higher amount of healthy fats. I was prompted to read this article because I bought some tuna with soy bean oil in it by mistake. I will make sure going forward that whenever I buy tuna it is in water only. I’m sorry but I don’t know much about pet food – it would be better to ask your vet about this. As for the soy milk, sorry to hear about your side effects – if you can’t drink regular dairy, almond milk or coconut milk could be good alternatives. The best food sources of vitamin D include fatty fish like salmon and mackerel, eggs, mushrooms, cod liver oil. Obesity in the US has everything to do with hydrogenated vegetable oils (forbidden in Europe and only very recently forbidden in the US too), and using fructose syrup instead of natural sugar. (Partially) hydrogenated vegetable oils don’t really have a unique effect on obesity. They are terrible for health, sure, but they are not behind rising obesity rates. Obesity rates are rapidly rising across the EU (especially Western Europe) and the US, and it is mainly due to too much non-satiating industrially processed foods in too high quantities. There isn’t really one ingredient that causes obesity – it is our overall diet and lifestyle. That said, animal studies show soybean oil to be obesogenic, and no oils are particularly nutrient-dense, so it certainly doesn’t help given the quantities it is consumed in. Thanks for the valuable information which is very important for people’s awareness about use of soyabean oil in food. We will be alerted in future about this oil. Thank you very much. This makes me question why so many want the government controlling everything. If soy bean oil is so bad for me, why does the FDA allow the use of it? The same can be said for tobacco and trans fats; we’ve known both of these can cause harm for a long time, but they’re still available to buy. I suppose there are healthy foods and not so healthy foods, and it is consumer choice which they go for (and which they can afford). Where can we get some extra Omega-3s to counterbalance the extra Omega-6 ? I was buying Sunflower oil in lieu of canola and now need to find avocado oil that isn’t in a spray. Coconut and olive impart too much odd flavor when you are baking a cake! I wonder will avocado oil? Avocado oil is relatively tasteless, so it might be OK! Or just butter would be a good fit for a cake? Good sources of omega-3 include oily fish such as herring, sardines, salmon and trout. Try refined coconut oil it has no taste. It is inhumane the way they market soy products claiming how healthy they are. I feel health food is another racquet of destruction for profit only. Soy also affects the way you think…mood swings, hostility. Also makes you feel weak and fatigued. Working out is great, and exercise is always advisable. It’s tremendously healthy, but it doesn’t really cancel out the harms of a bad diet, poor sleep, or other bad lifestyle factors. You are absolutely right. They do use canola or sometimes sunflower oil. I guess for me soybean oil has always been the worst but I know that canola isn’t a great option either. Olive Oil, Walnut, Coconut and Sunflower are good choices. Mayo, Best Foods and others that contain soybean oil are poisonous. They are all trying to poison us. I would also stay away from sunflower oil – it is ultra-processed and contains extremely high amounts of omega-6. Cold-pressed fruit oils (avocado, coconut, olive) are all great. Interesting, Chinese have consumed thousands of years soybean oil and they are definitely slimmer than the people from the USA. There are so many dietary, environmental, genetic factors which affect people’s health. it is overgeneralization by saying overweight of US people due to increased consumption of soybean oil. Soybean is not the only contributor to the mentioned diseases. By the way, there is also production procedure for soybean oil called ‘’cold pressing”. Actually, the Chinese didn’t start consuming soybean oil until the 1960s…and they didn’t start consuming it in significant amounts (153 MT) until the late 20th century. Now? The domestic consumption is 17,200 MT and obesity there is exploding. You are correct to say that there are many different factors which contribute to obesity (mainly a bad diet), but soybean oil, sugar, and refined carbohydrates are some of the biggest villains for sure. Well said Michael and a great article. In most European countries soybean oil can almost never be found in the ingredients. Shocked when I moved to the US and saw that there is soybean oil in almost every loaf of bread that I found! Yes, it is in virtually everything. To be honest, most countries add some highly refined oil (be it soybean, canola or sunflower) to about 90% of packaged stuff. They also have the highest rate of stomach cancer…..known fact. Thank you for posting this informative and valuable article. I loved the way you would use the subjects and share their individual links. This article is a “keeper” for sure. It’s one that needs to be read several times as to retain the information stated here. God bless. Glad that you got something from it. You haven’t mentioned anything about organic soybean oil is it equally bad? Slightly better maybe? But most of the concerns remain, and soybean is not really well-suited for use at high heat. I would (ideally) stick to olive oil, and some other oils like coconut oil are very heat-stable too. Is Peanut Oil a Healthy Choice For Frying?